Looking towards Coventry from the Birmingham end of the down platform showing the oil lamps on posts against the fencing circa 1930s. The goods yard is beyond the station and level crossing. 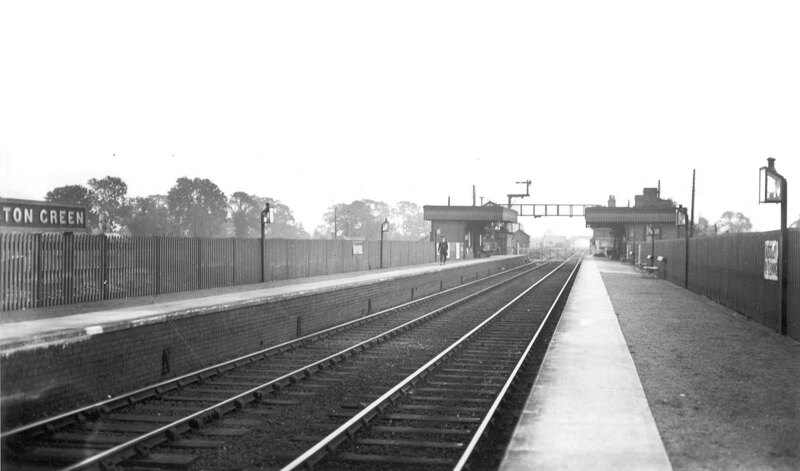 Due to the station being built much later than Tile Hill the platforms were constructed opposite each other rather than staggered across the level crossing. The signal is a little unusual being cantilevered towards the track in the same style as seen at Hampton in Arden's goods yard. There are no sighting issues for drivers as the line is fairly straight so why a conventional signal wasn't used is unknown. The station is very rural but within a few years it was surrounded by both housing and a nearby airfield that later became Elmdon then Birmingham International.